We don’t mean to brag, but have you noticed that it’s pretty busy around BAM lately? What with the Next Wave Festival in full swing, the Young French Cinema and IFC Sneaks series in BAMcinématek, along with various talks, visual art, and literary events—the BAM campus is bustling this October. While sometimes we think we’re busier than ever, it’s an interesting (and humbling) reminder that we’ve actually been this busy for a long time. If we go back 33 years, to the week of October 22, 1979, we see there was plenty of activity here at BAM. The 22nd (a Monday) kicked off the opening of the two-month Musical America Festival in the Helen Carey Playhouse (now part of BAM Rose Cinemas). The festival celebrated the music of ragtime and early jazz composers, with evenings dedicated to performances of the likes of Jelly Roll Morton, Scott Joplin, Irving Berlin, and Bert Williams. Up in the fourth-floor Attic Theater (now office space for BAM employees) the Dodger Theater premiered its production of Emigres, by Polish absurdist Slawomir Mrozek, on October 23rd. In a nod to Beckett’s Gogo and Didi, the two-person cast of Emigres told the tale of two bumbling Polish immigrants in cosmopolitan Paris, played by Coen Brothers actor Jon Polito and Brent Spiner of Star Trek: The Next Generation fame. On the 24th through 28th, Paul Taylor alum Senta Driver debuted two of her new dances in the Lepercq Space with her ensemble, Harry, with guest dancer Peter Anastos. 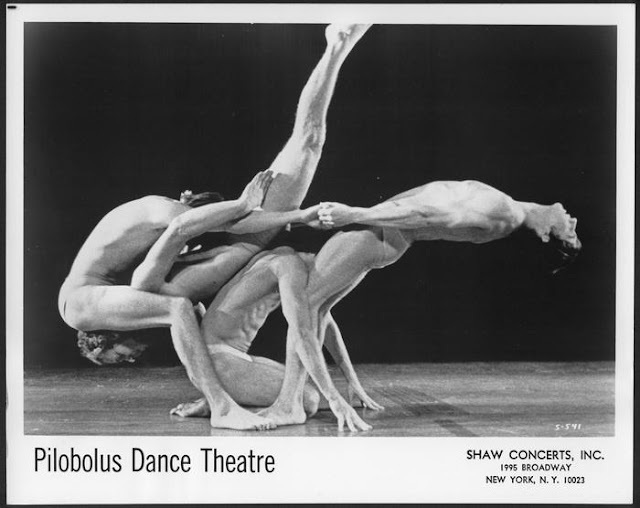 Harry’s dancers were known for their strength, agility, and propulsive energy. Driver’s choreography has been presented again recently by Movement Research at Judson Church. Starting in the Opera House on the 26th, the Brooklyn Philharmonia, led by conductor Lukas Foss, presented selections from Mozart’s Marriage of Figaro and Don Giovanni, along with Verdi’s La Traviata (which is the opera that has been most often performed at BAM). And, to top it off, choreographer Annabelle Gamson presented a four-day program in the Playhouse from the 25th through the 28th called From Isadora to Pilobolus, which was billed as a “Festival of Solos & Duets.” Included in the program were a range of both early and modern pieces by the likes of Pilobolus co-founders Alison Chase and Moses Pendleton, as well as James Cunningham and Viola Farber. All of these choreographers performed alongside Gamson, and they were accompanied by noted composer Bernard Rose on piano.